Recap of the Last 6 Games (Games 71-76) · Let's Go Amerks! Welcome to the 15th part of a 15 part season series highlighting the last five games. Well, this last segment is six games, showing off the stats, standings, highlights, transactions and whatever else took place. These were a little different than a weekly format and if you read them, thank you. Will likely take a new approach next season just going with a weekly recap and track trends. The final stretch of six games finished a mediocre 3-2-1-0 after previously going 4-0-1-0. Our schedules were off and we weren’t able to record a final podcast before or at the end of the regular season. We’ll have one going into the playoffs. For subscription options check out the most recent episode. Even though Zach Redmond has missed 18 games from a lower body injury he still finished tied for third in scoring by defensemen. Tage Thompson continued to score some points, make some mistakes, and get primed for the playoffs. Victor Olofsson scored twice in the second to last game of the season to reach the 30 goal mark. Rochester had a chance at the North Division title going into the last weekend of the regular season but a bad second period against Binghamton did them in and resulted in an overtime loss. Nine players rested in the final regular season and the team still pulled out a win and was able to crush the playoff hopes of the Belleville Senators. It was a great regular season and the team finished top 10 in franchise history. How they perform in the playoffs will tell the rest of the story. It’s pretty simple, score more than the other team and win! Amerks were outscored 19-18. Overall through the season the Amerks outscored opponents 254-218. Shooting the puck, creating more chances, and it creates wins. Amerks had a 184-172 advantage in shots. Four goals have to be featured here. Casey Fitzgerald scored his first goal, the 30th goal for Victor Olofsson, Dalton Smith beating Eddie Pasqule, and Andrew MacWilliam with an assist from D Smith and Veilleux. Andrew Oglevie – upper body – end of season – Played March 22, hasn’t skated since. 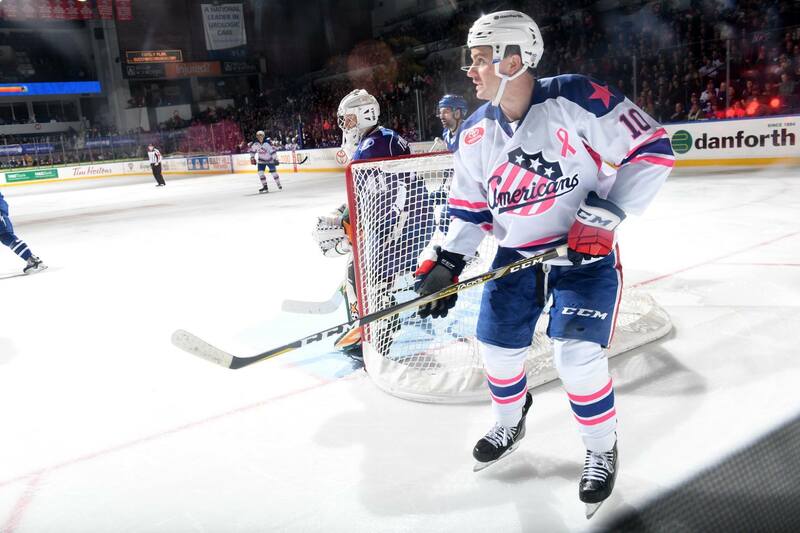 The Amerks are expected to be healthy going into the playoffs. Details on injuries over on the injury report page. The busiest time of year for transactions.